This is a post about banoffee pie. If you’ve never heard of it or aren’t quite sure what it’s all about, you’re in luck, because today we’re going to get down to the nitty gritty of this fabulous sweet and salty dessert. But today’s post is also about patience. It’s about waiting, and moving graciously throughout transition. So if you’re into gooey pies or love real talk on life lessons, stick around because we’re going to chat through it all this morning. You ever get the sense that you’re in a period of change? For some time, I have sensed that that’s where I was. Over Christmas, I mistook this feeling for simply being burnt out. Between a move, a full work calendar, and the first trimester of a sicky pregnancy, I was just kinda… blah. So I waded (and waited) through it, trimmed back on my to-do list, and took time to just enjoy the season with my kiddos. When January arrived, I knew it was time to get back to work. I jumped back into the grind, expecting things to flow as smoothly as they previously had been, and for some reason it just didn’t. Does this ever happen to you? 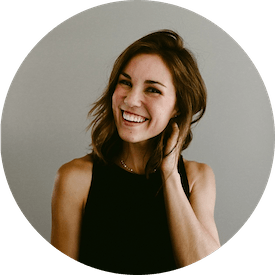 Do you ever find yourself feeling kinda stuck or lost, maybe even a little unsure of what your next step should be? Almost like you’re at some sort of fork in the path that you’re on, but there’s no arrow or roadmap to tell you what turn comes next? Well, that was me. Unsettled, uncertain, and at a loss as to what to do next. How do we wait gracefully for the next chapter of our story? Do we just idle through life and wait for the change in wind to blow us in the right direction? Do we stifle any feeling of discontentment, and play through the pain or hustle harder until some giant neon sign with whistles and bells dumptrucks us into a new phase of life? My small grouper leader has been talking about what it looks like to be peacefully at rest in our circumstances even when they’re undesirable or even just a little bit off. Being at rest doesn’t really mean that you just stop working all together and wait for a handout. It also doesn’t mean dwelling on the yuck and talking about it endlessly until a change comes. What I’m believing and what is beginning to really settle on in my spirit is that waiting gracefully means being at peace regardless of your circumstances. It means moving forward, working diligently in the time being, with your eyes peeled for opening doors ahead. It means being okay with not having it all figured out and content to continue being effective right where you are. I’m not sure if any of you all are in/have been in this boat that I’m paddling, but my gut tells me I’m not alone. There’s lots of us, men and women alike, who desire and even feel a change coming on, but the unknown and potentially prolonged period of waiting is straight up terrifying. My word for you today is that it’s okay to transition, and there is nothing to fear about stepping into the unknown when the time is right. Work hard, find joy exactly where you are for the time being, and trust your instincts. You’ll know when the time is right and you’ll have no regrets if you blossomed where you were planted for the time being. Is that enough real talk? Are you ready for pie? 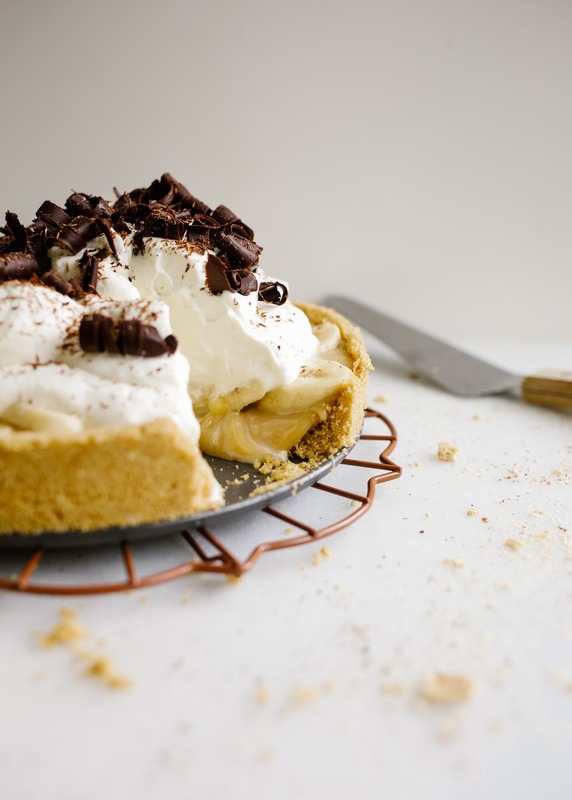 Banoffee pie is a traditional English favorite. In a true banoffee pie, a digestive cookie crust is filled with layers of bananas and thick, gooey toffee filling. Whipped cream and shaved chocolate are loaded on just before serving for a sticky, sweet, and altogether irresistible tasting pie. 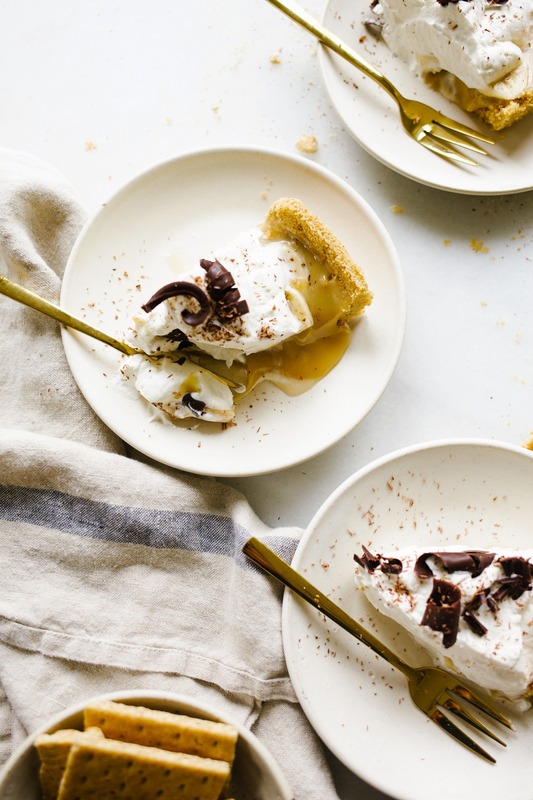 This version, fairly spot on with exception of the crust, hits the mark on every aspect of that traditional banoffee pie flavor profile, and it is nothing short of fabulous. 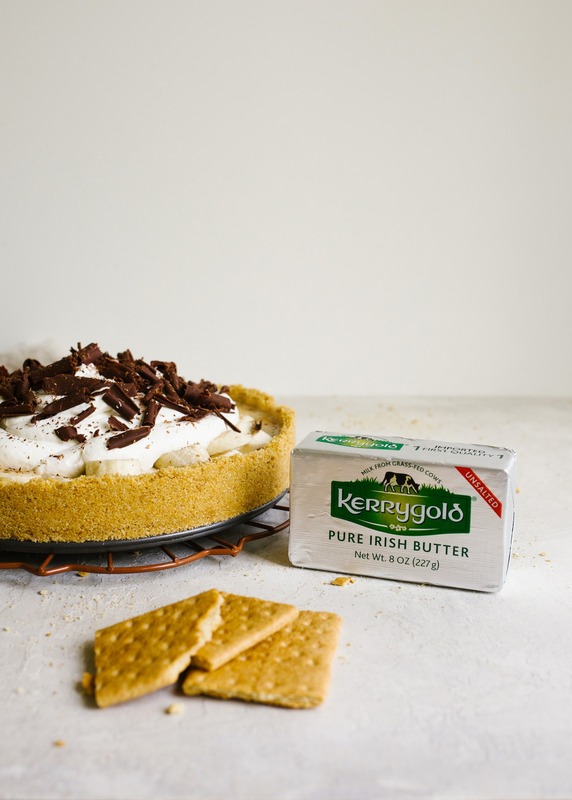 I’m sharing today’s recipe in partnership with my BFFs at Kerrygold. Quality butter makes a huge difference in taste in this pie, and you’ll notice the rich, buttery goodness in almost every element of it. In the crust, warmed butter brings together the salted graham cracker and brown sugar mixture. In the filling, butter balances out the sugary sweet toffee and lends a rich chew to every bite. Butter helps this chilled, gooey treat hold its shape in the fridge and lends it so much flavor. 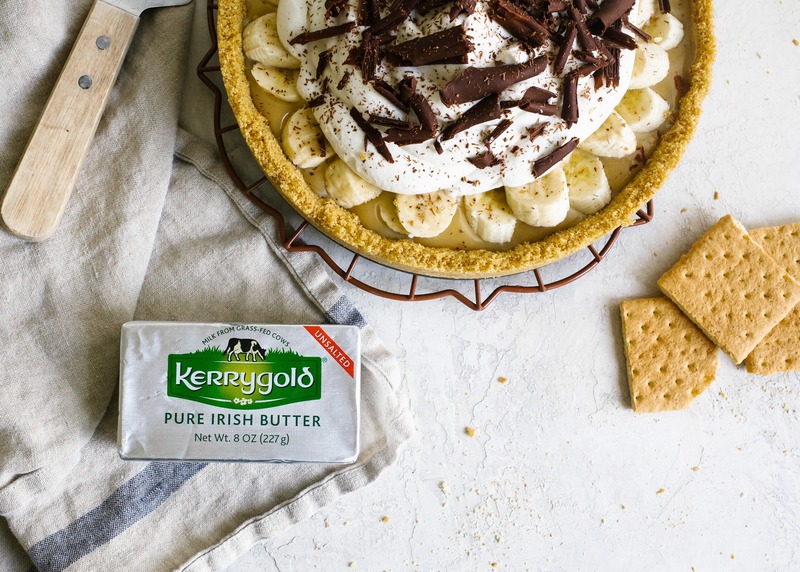 This is a dessert worth investing in quality ingredients, and you can trust Kerrygold to bring it every time. A few tidbits on this banoffee pie. First, it’s entirely no bake. The crust is a pat and chill situation and the filling is prepped on the stovetop. Second, this pie is messy. It’s not a perfectly sliced, prim and proper treat; it’s a lick the plate, sop up every bit of filling type of thing. Here’s what you can expect: the crust is a fairly standard graham cracker crust, except we use brown sugar for extra flavor and a little extra salt to balance out the filling. Truly, it’s a salty crust and that is in no way disappointing. The bananas, which you can layer underneath the filling or on top of it depending on your preference, will 100% weep and make this a seriously gooey drippy pie. If you hide your bananas under the toffee, the whole filling will become a bit puddly upon cutting, and if you layer them on top, you can maintain a little more structure depending on how close to the time of serving that you assemble the pie. Read in the notes section of the recipe for more on that. Finally, the whipped topping here is entirely optional, but whipped cream is almost always a great idea to me. It’s only barely sweetened and lends a creamy vanilla flavor to the whole shebang. If you want to land chocolate shavings like you see photographed, you can use the tutorial I followed here. This banoffee pie is one of my favorite things I’ve made recently. It’s maybe not much from an aesthetic standpoint, but what it lacks in structure and clean lines it makes up for in some serious level-up flavor. I really hope you’ll give it a try in the coming weeks. 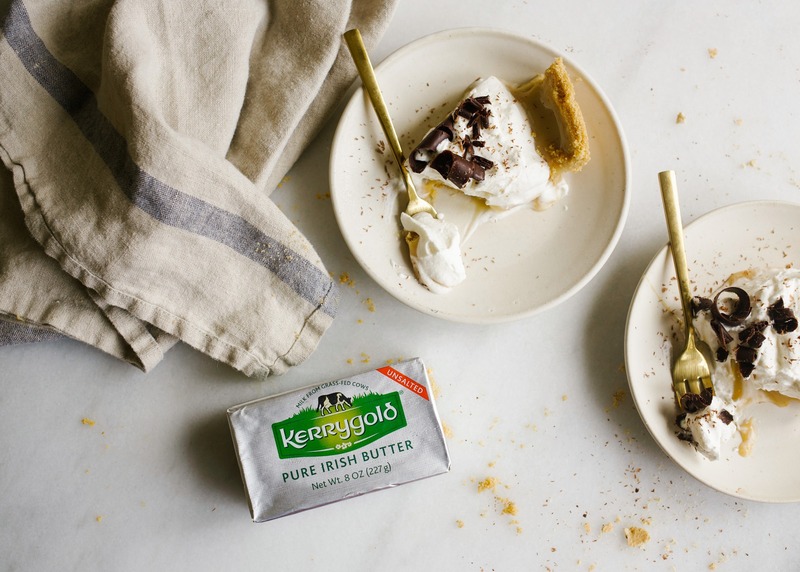 Many thanks to Kerrygold for sponsoring this post. Y’all, give it a try when you take a stab at this pie. Their butter is seriously divine. 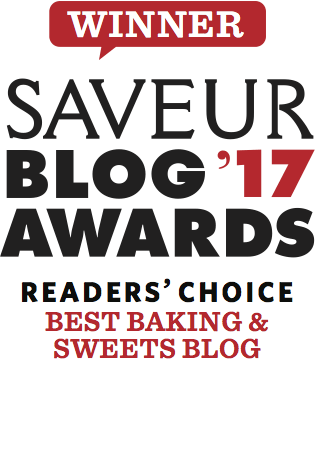 Happy baking to you all and thanks for reading along! 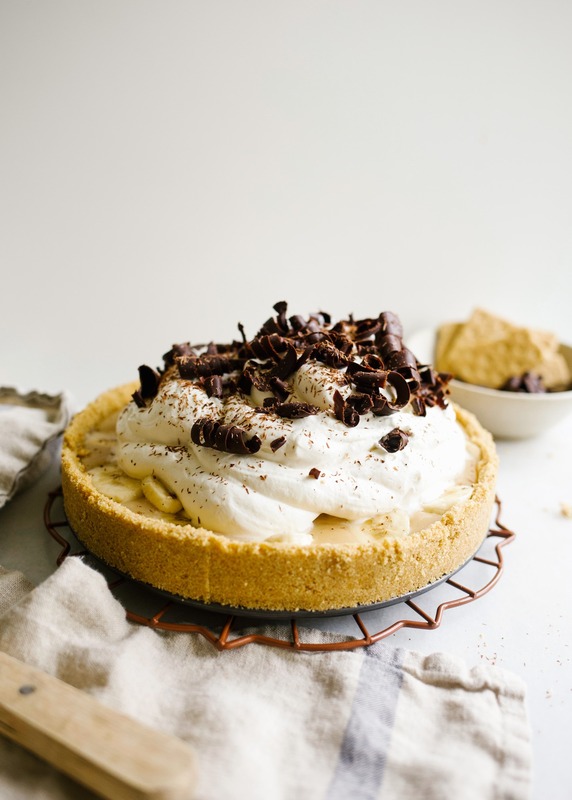 This banoffee pie is a salted graham cracker crust filled with a banana and toffee filling. A sweet and salty, gooey treat of a pie! Whisk together the brown sugar, graham cracker crumbs, and salt in a medium sized bowl. Add the melted butter and stir until well combined. Press the crumbs into the bottom and halfway up the sides of a 9-10” tart pan with a removable bottom. Place in the fridge to chill while you prepare the filling. In a saucepan over medium-low heat, combine the butter and brown sugar and stir regularly until melted. Add the sweetened condensed milk and stir to combine. Stir the contents of the pan regularly until the mixture comes to a boil and then cook, stirring all the while, for an additional 3 minutes. The mixture will barely thicken and may even darken a hair. Remove the mixture from the heat. Slice the banana into ¼” coins and layer then around the bottom of the pie crust (see notes). Pour the warm toffee directly on top of the bananas and place in the fridge or freezer to chill completely. Just before serving the pie, use the whisk attachment in the bowl of a stand mixer to bring the whipping cream, sugar, and vanilla extract into a whipped cream. Spread dollops on top of the pie and serve! If you don’t plan to serve the pie immediately, see notes for alternative options. 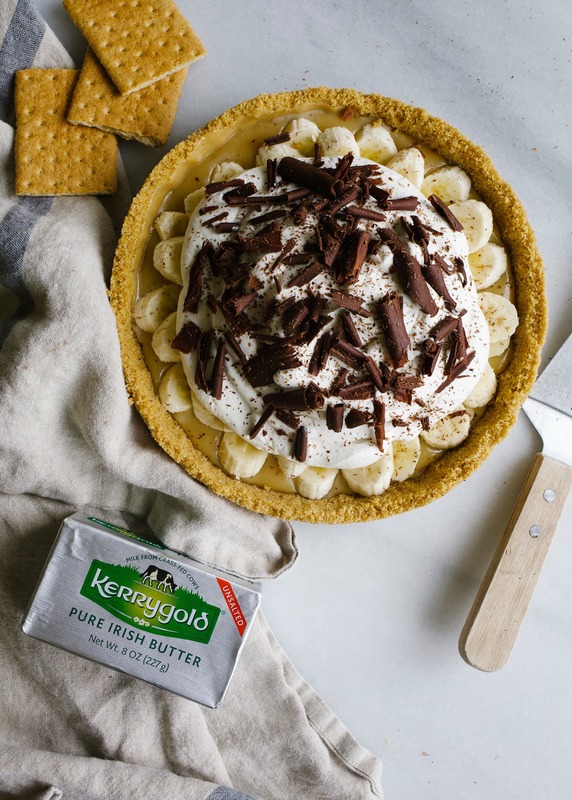 As an alternative, you can pour the filling directly on top of the pie crust and then layer the bananas on top just before serving. The bananas WILL WEEP inside this pie, releasing their juices and flavor. While this definitely enhances the flavor, it also makes for a messy pie. If you’re wanting slightly neater presentation, I’d recommend adding the bananas on top of the toffee just before serving, but keep in mind that these bananas will still weep, so serve quickly! 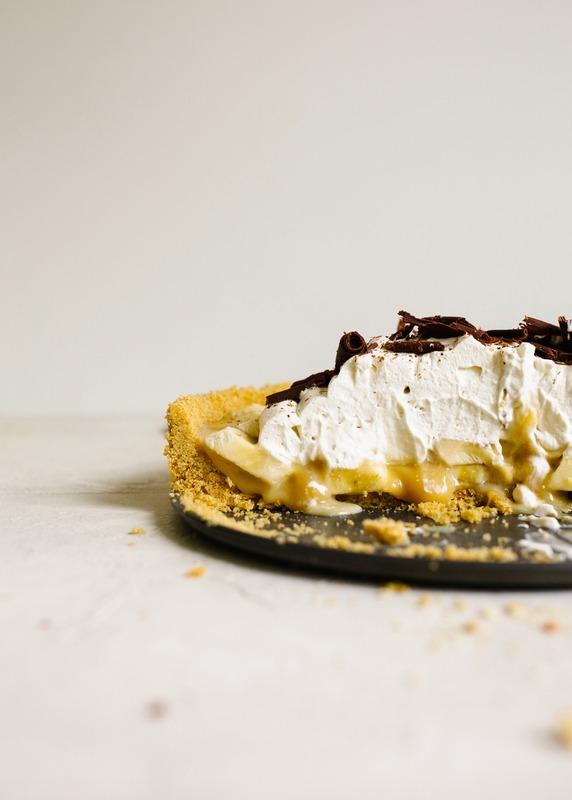 You can barely spritz the bananas with a mixture of lemon juice and water prior to topping the pie if you don’t plan to cover them with whipped cream entirely. This will stall the browning process. The crust recipe will yield a thick crust! If you don’t want your crust quite that thick, save 1/3 cup of the crumbs and use to sprinkle on top of the whipped cream. I have made this pie many times, it is a favorite. Beautiful photos and message. I feel the same way that you do and it is nice to know that I am not alone. Kate: Greetings. I am not into gooey pies, so this particular recipe didn’t resonate with me. However, you comments about transition and change – and how that can be scary at times – certainly did. I want to thank you for sharing. I find myself in this position. Retiring next year; considering where we want to live for our retirement; do I do enough to serve God? Your thoughts reminded me that God gives us one day at a time because he knows that is all we can really handle. I need to learn to be content where I am right now, continue to trust and grow in his love, and do the best I can with what I have, where I am. He will take care of the rest. Thank you for sharing. Love your recipes.